The last stronghold of an ancient race; the Bees – children of the Great Light, caretakers of the forest world. A warrior race – a race of artists, of dancers and engineers. Survivors of a distant holocaust that has almost extinguished their civilisation. It is a world of order. A world of timeless tradition. A world where one fertile Queen is the mother of an entire race. Where child-princesses fight to the death for succession to the throne. But the old Queen is finally dying. For the first time, a Queen’s successors will be adults. Adults with allies, with agents – and with armies at their call. While forces gather, an astonishing new secret slowly creeps out into the light. 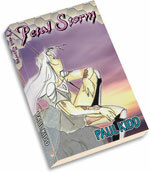 Petal Storm is a tale of imperial court intrigue – of tragic love, of battle, and of honour struggling against raw power. It is a story of true love and self sacrifice – of intrigue, betrayal and assassination. The skies shudder to massive battles between airborne cavalry, and the fate of an empire is decided by duelling rapiers. The characters of Petal Storm are a race of intelligent insects descended from honey bees; tiny bipeds only an inch tall. These creatures battle the hostile predators of their world with lance and sting-sword, like tiny knights keeping a universe of dragons at bay. Their civilisation is the product of centuries of organisation and tradition, having similarities to the Japan of the Shóguns and King Arthur’s court. The setting is a crisply detailed science fiction / fantasy environment. Our tale follows the political intrigues hatched by two rival queens struggling for dominance of a single hive. A beautiful book – filled with tragic love, haunting beauty – battle and romance, and haunted souls. The world it creates is astonishingly beautiful – a world deep amongst the grass and trees. A Seelie court hidden deep inside the leaves. I have never understood people who seem to have an aversion to insects. To me, they have always been the most astonishing expression of life on the planet. In colour and form, energy and infinite variety, they are simply astonishing. “Water Boatmen” in a pond, or a passing dragonfly have always enthralled me. Petal Storm has spawned a great many alternative incarnations. It has been scripted as a manga, and as an anime series. There is also a feature film which serves as a prequel, detailing the great wars between the Termites and the Hives. TAB – a wonderfully talented artist – has always been a devoted supporter of the project. 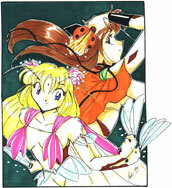 It is her manga art that graces the cover and the appendices. I owe her a great deal of love and respect for all her loyal support.